Martha started school a week ago Thursday, and Claire and I decided to take advantage of the gorgeous weather and do a little exploring. FIrst we went to one of my favorite Paris spots, the Musee Rodin, which is a long walk or a short metro ride away from our apartment. Anyone who visits me will be required to go, because it’s a real gem. The museum is housed in a gorgeous 18th century townhouse, which originally was a school for young girls. 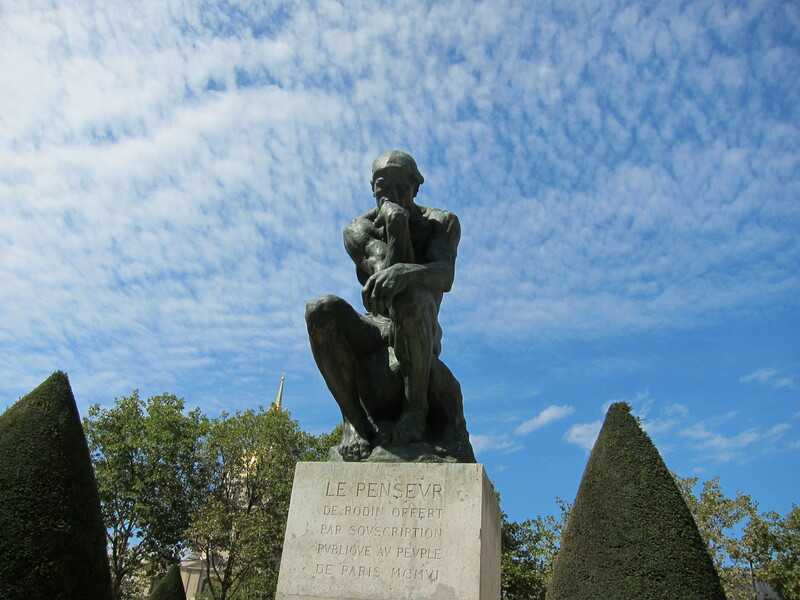 Rodin began renting it in 1908 and it was his Paris residence until he died. Inside the house are many of Rodin’s sculptures, drawings, paintings, and documents. Remember The Kiss? It’s in there. As beautiful as the house is, it’s the garden that charms me (and you can buy a separate garden admission for only 1 euro!). 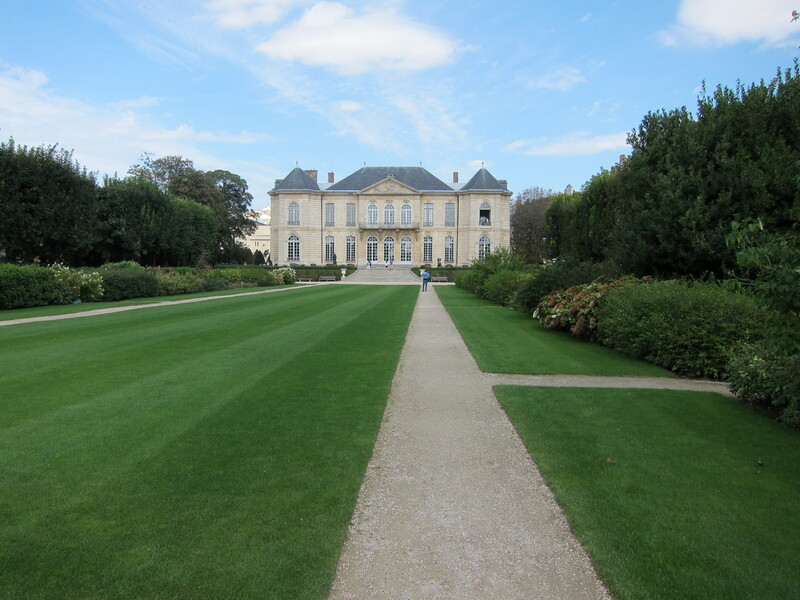 Covering over six acres, the garden is divided into formal sections, and each is sprinkled with Rodin’s actual sculptures. 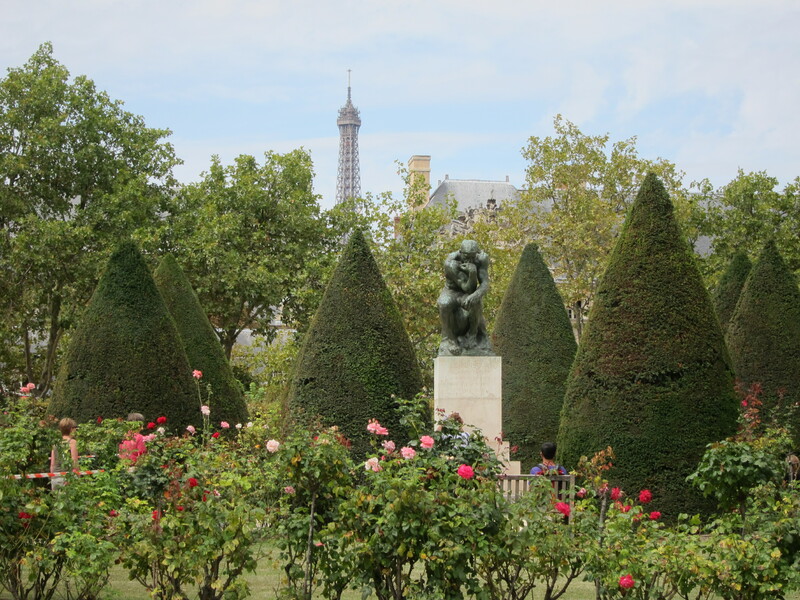 Possibly his most famous sculpture, The Thinker, sits in the rose garden, which was in full bloom. View of back of the house from the end of the garden. 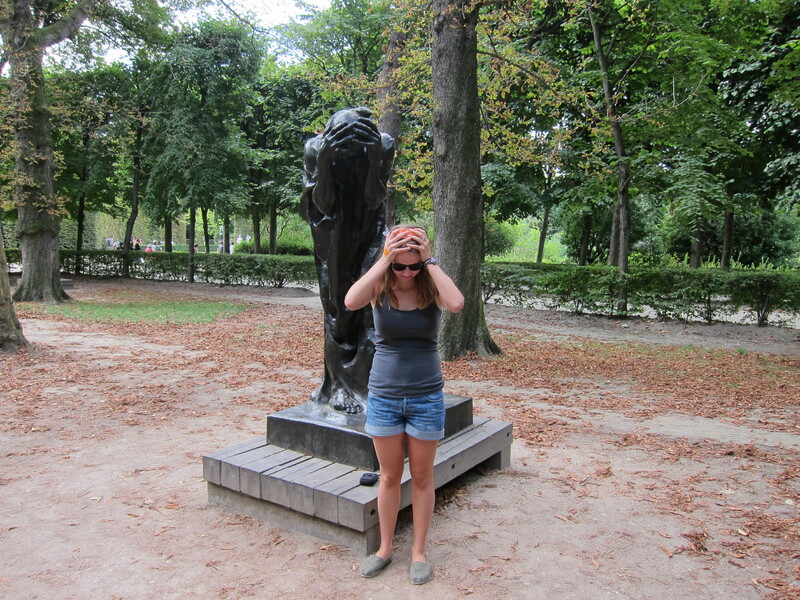 You can see why Rodin kept his lease. Claire was overcome by it all. 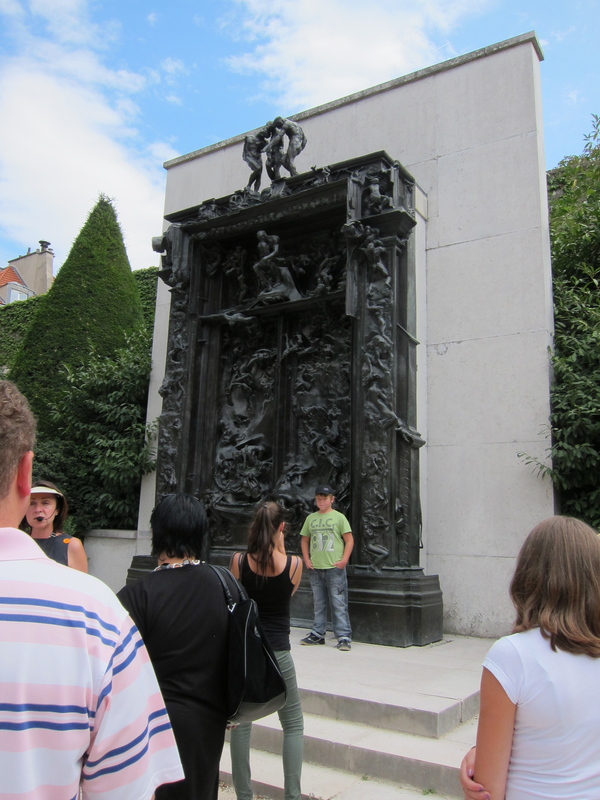 The Gates of Hell were also sitting out in the garden- surrounded by tourists. There was also a charming little sidewalk cafe in the garden, where we indulged in gelato to celebrate our wonderful day. And because we both just kind of wanted gelato. And that concludes our tour. Thank you for visiting! Have you been tot he Musee de L’Orangerie? It’s in the far corner of the greens that stretch out in front of the Louvre. Go there! Best museum in Paris (although I haven’t been to Rodin’s yet). Make sure you go in to the basement and have plenty of time to spend there. Monet donated his waterlilies to the country after WWI and they are there, one painting per wall and breathtaking! I haven’t been there in a long time, but it’s an easy walk from here and I plan to visit soon. I think it’s particularly nice to go there on the heels of a trip to Giverny! We’ll do that when you come. Oui? Giverney….a perfect day trip! 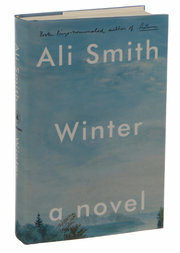 One of our many favorites! Just loving feeling like I’m there. You describe it all so well! Thanks for sharing! Didn’t know about this beautiful place. Will have to go some time. And yes Caroline and I enjoyed many a gelato on our recent European adventure. I especially like the pistachio. Is that a little photo of you or Claire on your blog? I’m thinking Paris agrees with you! Looks sooooooo lovely! Have you gotten to the Picasso Museum btw? Can’t remember if I had asked you before, but it’s a wonderful museum and the building and grounds are also were a visit as I recall. I haven’t been to Paris enough to make any fabulous recommendations beyond – visit the Eiffel Tower – incredible! Hey Kate! Love this.. keep it coming!